The groups are taken by Ellie Brown, Jannet Ricketts, Carly O'Hara, Ronnie Haydon, Caroline Evans & Adele Prince all fully qualified England Athletics coaches. 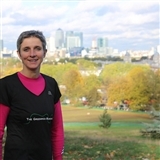 The groups are supported by Run Together and the Royal Greenwich Park and we are actively involved in promoting running in the community. Market Studios, Durnford Street, 18-23 Greenwich Market.